Just a short walk from Harajuku Station, Sakaeya is a family-owned shop (the CEO is a cat!) 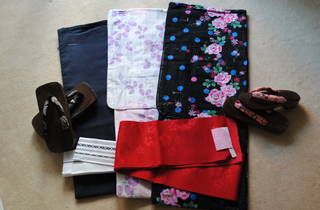 and the ideal place to look for a yukata or kimono, and experience a tea ceremony. You can buy a brand-new yukata for ¥6,000 (obi included), or spend ¥10,000 and they’ll throw in dressing assistance and a tea ceremony. You can even add hair and make-up and a photoshoot, then strut around Meiji Shrine in your outfit. Available in fits up to US size 16. They request that you make a booking before you visit; check the website for details. Address provided after you make a booking.